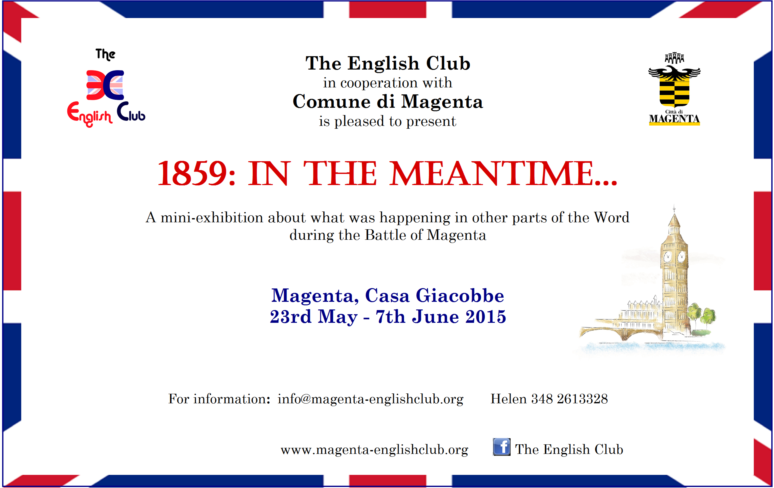 1859: in the meantime…. with The English Club! Here we are again! Another month has gone by. Did you enjoy the play ‘Keep Calm and Kidnap the King’? There were certainly a lot of people there and they all seemed to have a great time. A big thank you to the director Riccardo Colombini of Schedia Teatro and all the members of our theatre group. We’re a bit late with this newsletter because we have been busy preparing our 1859 exhibition. It opens officially Saturday 23rd May in Casa Giacobbe (Via 4 Giugno 80 – Magenta) at 5:30 pm but members can get a preview at our next meeting on Wednesday 20th May (9 pm in Casa Giacobbe as usual). The title is ‘1859 – in the meantime’ and illustrates a few famous people and events in Great Britain and USA at the time of the Battle of Magenta. It is our first attempt at anything like this but we’re really satisfied with the result. The ‘4 Giugno Group’ has done miracles. Come and see. 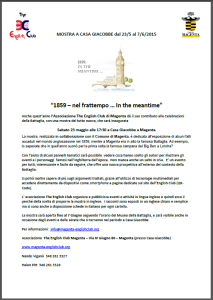 And if you can’t make it on Wednesday then you MUST come and support the Club at the opening ceremony on Saturday 23rd May at 17:30 when we have invited representatives from the Comune who have included it among the official events of the Battle celebrations. Come on! It won’t last long and there will be a small buffet for all visitors. Tempted? 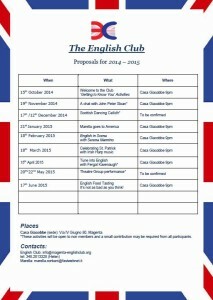 Please help us to make this new project a success. We have really worked hard!! Getting back to Wednesday. As we anticipated in the last Newsletter we have to renew our organization committee every three years and this year it’s time to vote. Really it is just a formality. Three old members will resign and we have at least three new candidates in line. You can meet them at the Club on Wednesday 20th May as they belong to the ‘4 Giugno Group’ and are going to present the new project to you.